Thank you so much for attending Lodie’s Celebration of Life on 10 January 2015. For us, his family, it was a privilege to listen to all the memories that were shared. To all Lodie’s friends who sent emails and messages, we thank you for being part of the Celebration even though it was not possible to physically join us at the Bosboma in Pretoria. I would like to share a few pictures with you, taken by Sandra from D Square Photography. May his spirit roam free in Africa, and may we never forget the special impact he had on all of us. Lodie’s family is inviting you to join us on 10 January 2015 from 11:00 for a celebration of his life. The celebration will be held at the Bosboma, Koedoespoort, Pretoria. The address: Plot 92, Kameeldrift East, Kameeldrift Ave.
From the N1, take the Zambezi Offramp (new name: Sefako Makgatho) and turn in an easterly direction towards Roodeplaat Nature Reserve. After approximately 1,9 km, at the stop (after Spar shopping complex) turn left. 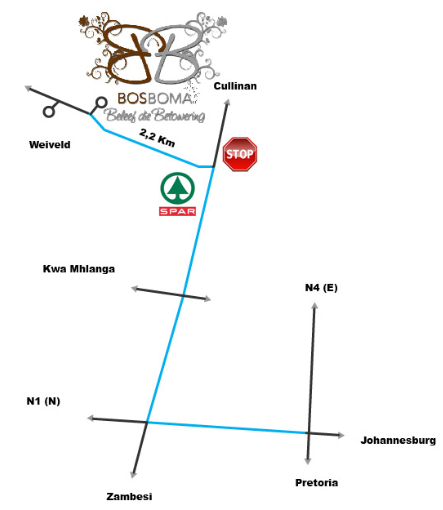 The Bosboma will be on your right after approximately 2,2 km. For your convenience, please see the map attached. Please come and share special memories with his family and friends. In the spirit of an Irish Wake, everyone will have the opportunity to ring the bell and share! "Give me a light, that I may tread safely into the unknown!" "Go out into the darkness and put your hand into the Hand of God. That shall be to you better than light and safer than a known way." I am posting this update because I know that most of Lodie’s friends have no way of getting in touch with him and would like to know how he is doing. After his release from the day hospital in Pretoria, he wanted to return to his home at all cost. It soon became clear that he needed constant care and therefore was admitted to a care facility in his hometown, Naboomspruit, on 11 December 2014. As soon as he becomes stronger, he would like to return home again. He will start with physiotherapy on Monday, 15 December. His doctors are trying to manage his pain, and Lodie is still positive. Thank you once again for all the messages of support, and the prayers for Lodie. His apologizes for the long silence, but a lot happened since his last post. 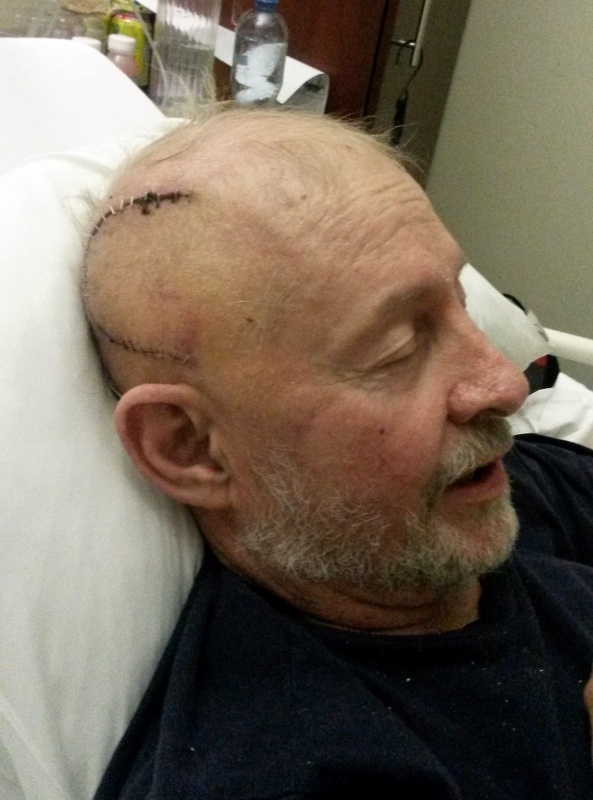 A tumour has been removed from his brain on 22 October 2014. After a short stay in Intensive Care and the Oncology ward at Wilgers Hospital, he has been transferred to the Intercare Day Hospital in Silver Lakes. He is currently receiving intensive occupational and physiotherapy to regain the full use of his left arm and leg. He is therefore struggling to use his laptop and phone, and would like to thank all for the good wishes, messages, prayers and thoughts. 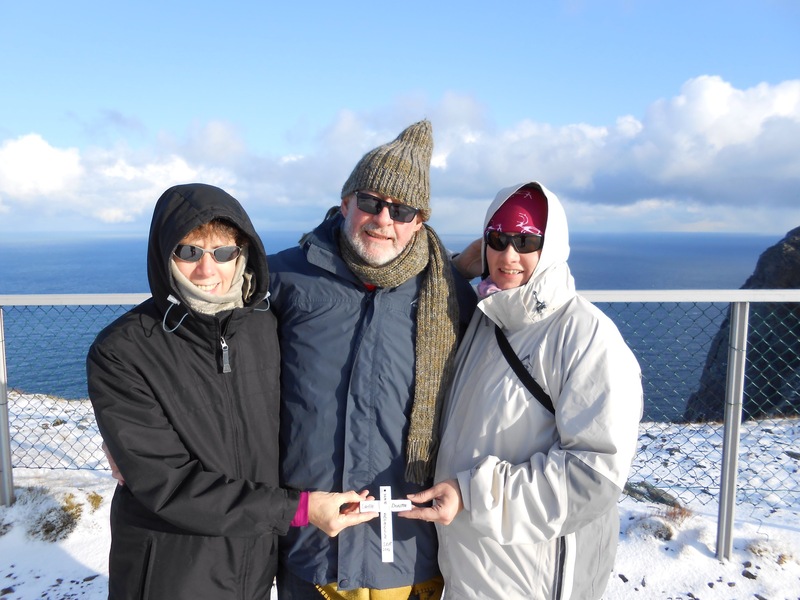 The magic of our sibling’s trip to Nordkapp is nearly over. Nearly? Yes, because due to Air France and the two week strike that ended last night all our plans are messed up. Ina, living in the USA, sits stranded in Paris, waiting for a chance to fly to Washington. The other three of us are still in Helsinki and will fly later this evening to Paris, where our journey ends for the time being, thanks to Air France. So what are we going to do? Chámps Elyséees? Montmarte? Hey wait! This privilege is due to the strike. Another day or two of unplanned tramping at some excotic destination is an added bonus.. Pity for the missed working day or two, pity for my youngest sister who misses her husband and two boys. And this is the essence of life and travelling. Someone said life is what happens what you haven’t planned. I say go for the ride! And as long as Air France pays for the “inconvenience”, enjoy the ride as well! 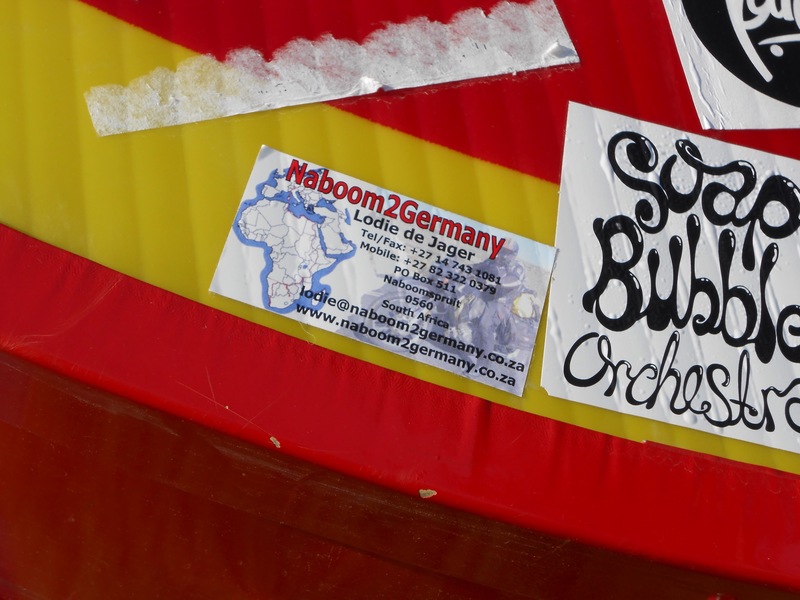 My Naboom2Germany sticker on the Artic Circle survived cold winterdays, sunshine and greedy hands removing the stickers. Only two days left of our wonderful trip. 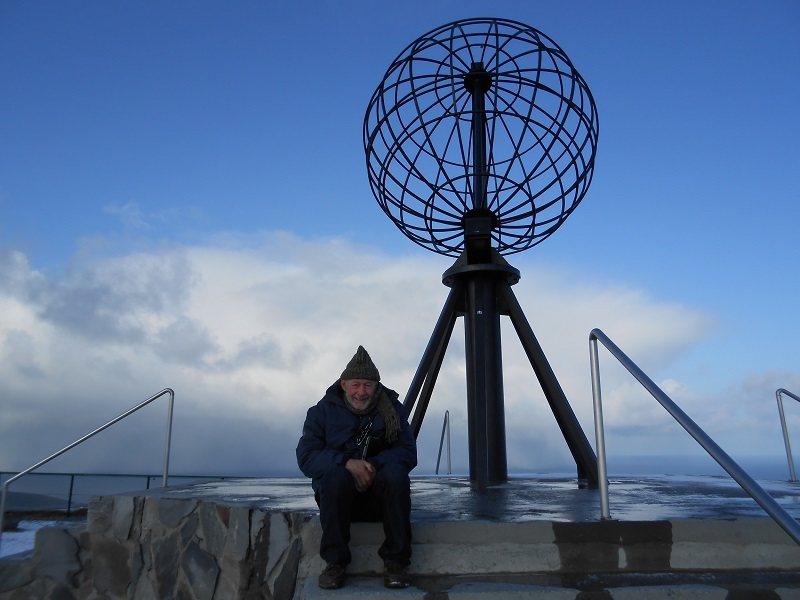 PS.Tthe blog is in Afrikaans.